Just as there are a number of toxic food for dogs, there are toxic foods for cats as well. Though it might seem tempting to feed your cat food from the kitchen pantry, it's important to take a close look at what you're feeding him. The wrong foods will make your cat sick, or cause fatal health problems which could lead to coma or death. Here are ten foods cats should not eat. While most cats love milk, it may not be the safest for them to consume. Actually, they shouldn't be eating any dairy products. Cats lack the enzyme lactase, which is required for proper digestion of the proteins found in milk and dairy products. Because their digestive system really can't tolerate milk, they often experience stomach problems like diarrhea and an upset stomach upon consumption. Canned tuna, packed for human consumption, lacks necessary nutrients that cats need and often contains mercury. Too much mercury can be toxic, and sometimes leads to mercury poisoning in cats. Furthermore, feeding canned tuna to a cat on a regular basis can cause nutritional deficincies. Just as garlic and onions are toxic to dogs, they're not good for your cat either. Onions contain a substance called N-Propyl Disulphide which can actually break down a cat's red blood cells and cause anemia. Garlic, chives, and similar related vegetables contain the same substance in small amounts, and can also cause gastrointestinal problems. Similar to dogs, chocolate can actually be lethal to cats. Chocolate contains theobromine, a toxic substance for most animals. All chocolates are dangerous, however the worst kinds for animals are dark and unsweetened chocolates. 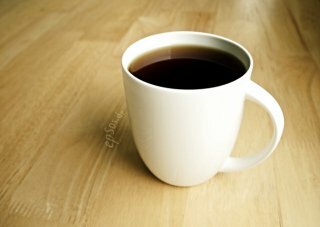 Consumption of it can cause seizures, tremors, abnormal heart rhythms, and death. Though it's not clear why, research suggests that grapes and raisins can cause kidney failure in cats. Small amounts of the fruits can make a cat sick, signs often including vomiting and hyperactivity. Though it may seem like a no-brainer, alcohol can cause adverse effects in cats, and more pets are killed from alcohol poisoning than most people realize. Alcohol effects animals like it does humans, with one important difference. Cats are smaller than we are, and a couple teaspoons are enough to put your cat into an alcoholic coma, and can potentially cause death. Caffeine in large enough quantities is essentially poison to a cat, and can often be fatal. If your cat is suffering from caffeine poisoning, he may display symptoms like rapid breathing, heart palpitations, restlessness, fits, and muscle tremors. Bones, especially cooked bones and bones found in fish, can splinter and cause lacerations or obstructions in your cat's digestive systems. Fat can make a cat sick, often with vomiting and diarrhea. Fat trimmings are also thought to cause pancreatitis in some cases. 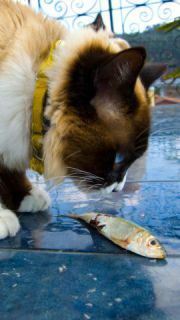 There's an enzyme found in raw fish which can destroy thiamine, an essential B vitamin that your cat needs. Thiamine deficiency can case serious neurological problems which could lead to convulsions and coma. Dog food is formulated specifically for dogs, and therefore lacks many of the essential nutrients that cats rely on. It won't necessarily hurt a cat to have an occasional bite of dog food, but a steady diet of it can lead to severe malnutrition. Other toxic cat foods include raw egg, xylitol, candy, yeast dough, human medicine, baby food, human vitamin supplements, marijuana, macadamia nuts, persimmons, rhubarb, salt, and tobacco. Be sure to keep a close eye on what your cat eats to keep him free from poisoning. Also Read: 10 Foods You Should Never Feed Your Dog, and 4 Tips For Choosing Healthy Pet Food for more feeding information. The "How Did I Get in This Situation?" Animal Video of the Day!! !